Dave: The step in feel on the 890v6 is super sweet! I’m locked and loaded the way I would want to be in a lightweight performance trainer. The previous versions of the 890 had way too much tongue, and had a last that never really related well with your foot. One slide into these and you know it’s going to be a great fit! It also looks fresh. Sam: The 890v6 fit me true to size just right for a shoe between racer and trainer. I would characterize it as a super comfort performance fit, I dig the generally horizontal pattern of the engineered upper with the dark areas being breathable slits which not only look cool but help with the seamless upper flex. Jeff: Very light and performance oriented, excellent fit with locked down, yet comfortable and breathable upper. Extremely stiff at first, but after a few miles broke in nicely and super responsive. Sam: This is one heck of an upper. While seemingly all of a piece due to consistent colors and pattern from heel to toe the front toe box is actually a very soft pliable yet fairly substantial engineered mesh while the mid foot saddle is fairly stiff. The look continues all the way to the heel with a rigid rear of heel counter with more pliable wings. The lightly padded patterned tongue also has horizontal fairly deep and sticky ridges for a secure tongue and lace hold. Dave: Outstanding upper! It molded extremely well to my foot from the get go and just got better as I put the miles on them. Slight pinching in the toe box on the left shoe causing my pinky toe and my ring toe (no I don’t have a toe ring...but it’s what it’s called!) to be crammed. Jeff: I am very impressed with the upper of the 890v6. It is not only very modern looking (a bit of a Storm Trooper/Star Wars look to them), but is amazingly effective delivering comfort, breathability and a locked down fit without any excess or feeling too minimal. Lacing is secure and precise with ideal fit achieved on first tie. Fit is true to size without much wiggle room, but the upper has enough give that my foot does not feel at all confined. Dave: The midsole boasts a ton of snap! This is quite a powerful shoe. I am always wary of anything NB throws at you midsole wise, because it is always so stiff. I warmed up nicely to this shoe. Jeff: The midsole is firm and exceptionally responsive with a lot of get up and go. On days where I feel fast, the 890v6 responds appropriately and on days where I am not feeling so spry, the 890v6 coaxes me to go a little quicker. 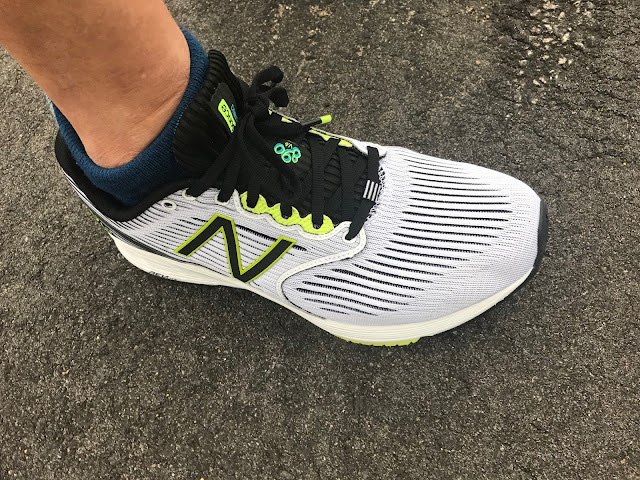 I think I was expecting a bit more plushness to the cushion and wanted to use as a more spirited, uptempo cushioned trainer, but I’ll admit that after faster running on cement or paved surfaces, it does not take long for my legs to feel a little beat up. Running quicker tempo on gravel paths however seemed to be the sweet spot for me and the firm cushion was less of a concern. Sam: The 890v6 has a very firm midsole characteristic of its RevLite foam. 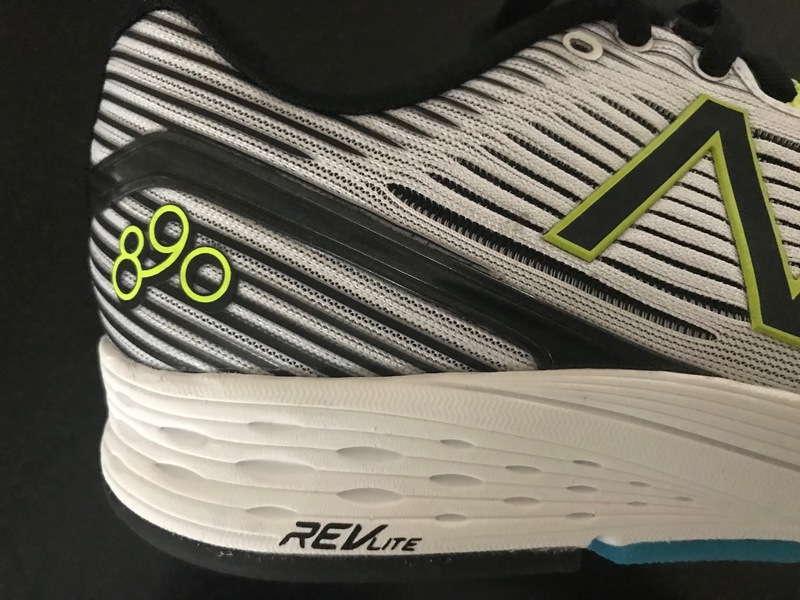 RevLite tends to be a highly responsive foam with tons of pop but one that leaves my quads more sore than in most shoes, even performance trainers. When combined with the outsole design, we get a stable performance trainer which while not containing any midsole post can serve faster runners seeking some support/stability characteristics. Upfront the orange TPU strips, reminiscent of adidas Torsion in the Tempo 9 (RTR review) but longer and a bit softer flexing. 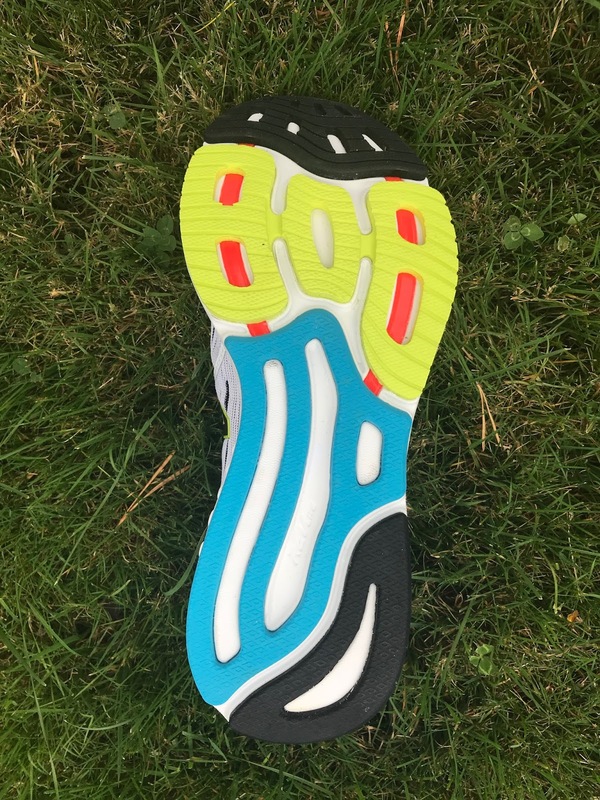 These strips contribute to the distinct toe off snap of the 890. Dave: About 30+ miles in an I see no signs of wear on the outsole. However, being in the lightweight performance category, my guess is no more than about 250. After 4 or 5 runs, I’m not going to lie here, the shoe lost some “snap.” I intend to beat this shoe up. Jeff: The outsole is a clever configuration of various grade rubber in key wear areas that allows for very good traction and wear characteristics. After 35 or so miles, I am only seeing a very slight bit of evidence of use where I toe off, but otherwise nothing. The deep grooves can collect the occasional rock or stick, which happened to me on the first run, but never since. Performance is equally good on pavement and cement as it is on gravel paths, but I would steer clear of anything more technical than gravel paths due to the likelihood of the grooves collecting rocks and lack of lugs. Dave: Snappy, Quick and fast. My stride feels great in the 890v6. 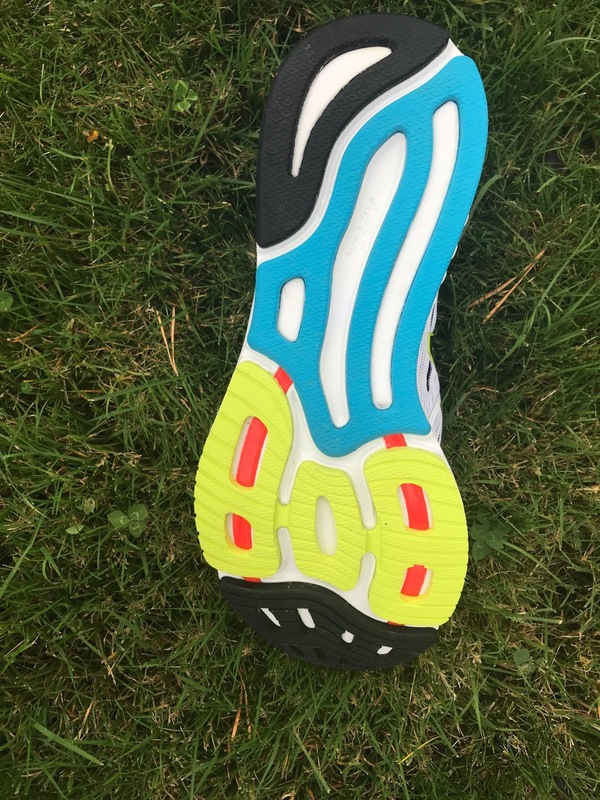 However, as stated above the shoe did lose its peppy feel after 5 or 6 runs….something similar I noticed in the Skechers Performance Go Meb Razor. I do question overall midsole cushion durability. Jeff: Really fast and responsive, though a firm ride and a bit stiff. There was about a 5 mile break in period for me until the 890v6 really seemed to come into it’s own. Since then, I have not noticed any decline in response and in fact, like them more and more each run. 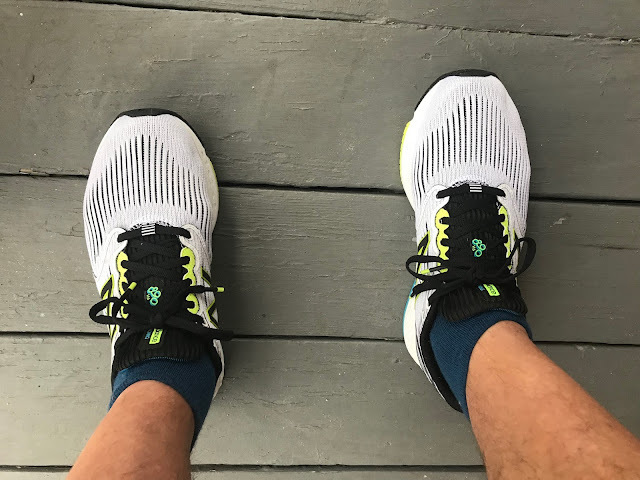 Sam: I agree with Jeff and Dave that the 890v6 has a snappy fast ride but... it is a firm stiff ride for me with the main issue the blue mid foot outsole getting in the way of my transition at anything other than a lively pace. Jeff: I am unable to compare to previous versions of the 890, but I am very impressed with the performance of the v6. It is light, sleek and fast, an ideal shoe for anything from 5k to a half and just about any uptempo training day. I personally was hoping for a bit more plushness and give to the cushioning, though this is not necessarily a knock on the 890v6, but more of a personal preference for me. 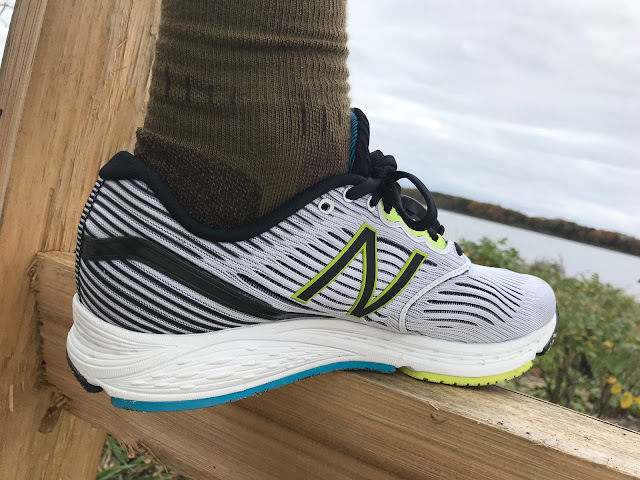 Some may find the 890v6 to be adequate for distances beyond a half, but would likely be the runner who is younger and/or is much more accustomed to pounding out fast miles on hard surfaces (I am neither of those). All in all a great shoe for specific fast uptempo training and half/sub half racing, but definitely not a daily mileage shoe (at least not for my preference of more plush cushioning). Sam: This is a shoe for faster runners who enjoy a firm, highly responsive and stable ride. Not really me most days but for sure my younger much faster fellow reviewers. At slower paces they are not much fun but that's OK as they are not really intended to mozy along in. The inherent stability from the firm RevLite and outsole design could also make it a good uptempo shoe for those who train in stability/support shoes, all of it in a shoe not quite 9 oz, something hard to achieve. All of that high performance chassis is well comfortably held to the foot by a very comfortable, secure upper that also looks great. I wish it was a little less stiff and also a touch less firm to increase both its comfort and versatility. Dave: A great update to a shoe that showed tremendous potential with the 890 series some years back. They just never hit those on the head. Here, I really feel they are onto something. It’s honestly one of the better NB I have ever run in. Most of their shoes are far too bulky and stiff (minus the 1400v5, which is a badass racer) The 890v6 does lack some cush for me. I would like to see some added protection, here. It’s not a shoe that I would grab for a recovery day post workout. I tried some recovery miles in them and felt like it was not enough underfoot. This is an uptempo day, Fartlek, Half/Full Marathon and even a mile repeat on the track type of shoe IMHO. It just lacks the cush for me to be a go to shoe, daily. - 1 point for lack of a tad more cush, especially in the forefoot. Toe box a bit snug. Midsole on point. Aesthetically, I’d rock this causally as well. Wish I could give points back for the upper! New Balance 890v6 vs. New Balance Vazee Pace (RTR Review) Dave: While aesthetically these 2 may look alike, I found a completely different feel between the two. Yes, they are 6mm drop, but the ride is much more enjoyable in the 890v6. The 890v6 is just plain more powerful. It has far more snap and is light on your foot. You barely notice it is there. It's smoother in heel to toe transition and boast a less stiff midsole as Vazee Pace is pretty much unbendable (sorry neutral trainers need to bend IMHO). VP does give you more underfoot in terms of cush, but I found the shoe to be so stiff, the cush never came into play. I simply never broke the shoe in. I used to think the overall step in feel of VP was nice, but with the new engineered upperson 890v6, there is no comparison. It's like a slipper, whereas VP I continually was adjusting the lacing for a solid mold to my foot. The 890 v6 has the same last as the Pace but a different execution of mesh that will be the main factor in change of fit, so potentially a "roomier" foot to foot fit. Technically speaking the percentage of outsole covered is similar, but the design make it look like it has greater coverage. All of this dials into the snappy ride we were aiming for through the midfoot and into to-off. The Pace comparison is apt, but the spirit of the shoe returns to that of the original 890: simple, clean, fast and intuitive on foot. The 2090 is a close comparison. While weighing only 0.2 oz more than the 890 its heavy dense and warm but effective upper saddle hides a more cushioned and forgiving ride but still a firm ride. The deeper cored out midsole of the 2090 plays a big role in its smoother feel. The 2090 has more TPU under the outsole functioning as a springy layer of stabilizing cushion in the forefoot and some forgiving landing on the lateral side to the rear Take the under carriage of the 2090 and put the upper of the 890 on it and you would have a better shoe than either alone. Dave: Very Very similar, with the Razor giving me more underfoot. Both lack durability and in my opinion lose their “snap” after some runs. Does that make me want to not run in either? Hell no! These are 2 of my current faves. Dave: Midsole wins out with the NB. Everun is far too soft and the Kinvara has always beat my achilles up. However, if you were working in a run shop, I’d pull both of these for a runner looking for a lightweight performance trainer. Dave: Far more underfoot with the Adi Boston, but both have that nice quick ride and a smooth heel to toe transition. Both scream fast! Sam: Very similar in approach and feel to creating an inherently stable and stiffer shoe using outsole design, the ride is very similar with the 890 having a far superior upper and considerably more toe off snap. Sam: The closest comparison in terms of design and purpose. The Tempo is less firm and bouncier for sure due to its use of Boost. Its rear support elements are more vertical in nature whereas the 890's are directly on the ground with the Tempo agreeing better with my gait. In terms of upper, the Tempo is narrower particularly at the toe and is overall no comparison to the 890's superb well held comfort. This said if the Tempo fits you and it does me, barely, I would lean towards the Tempo for up stable up tempo running. Sam: Also a shoe with light stability features, the Liberty ISO is softer by a long shot than the 890 and really closer to a somewhat stabilized Freedom ISO than either the 890 or the Tempo. It takes more effort in the Liberty to stay directed in the path of travel and it is not nearly as responsive or snappy a shoe at faster paces while being slightly more forgiving under foot. The 890 was provided at no cost.The opinions herein are entirely the authors'. What about NB Vazee Pace? 890v5 will be replaced by VP, and I very love first version of VP: it's very responsive, cushined, durability (over 1400 km for my pair) and light. VPv2 is heavy, and I skip it. Now I buy FreshFoam Zante v3 - its looks like good shoes, but in is not so soft. Also my version of Zante (size US10) is much more lighter then 250gr - it 220-230gr. For now, is the new 890 replace VP? How close are they to VPv1? Thanks for bringing up the Vazee Pace. You are correct they are close it would seem by stats but... according to Dave who did in fact run them no comparison for him. We have added a comparison to Vazee Pace and Vazee 2090 to the review. 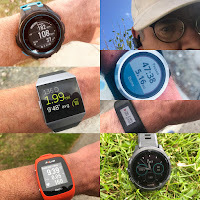 See our page with links to all reviews here http://www.roadtrailrun.com/p/blog-page.html You can also follow us on Facebook, Twitter, YouTube and Instagram where we publish interesting run related content more frequently as well as links to our latest reviews. Shopping through links on articles help support RoadTrail Run and is much appreciated. Interesting. I will try the new 890, when they will be brought to stores in Ukraine. 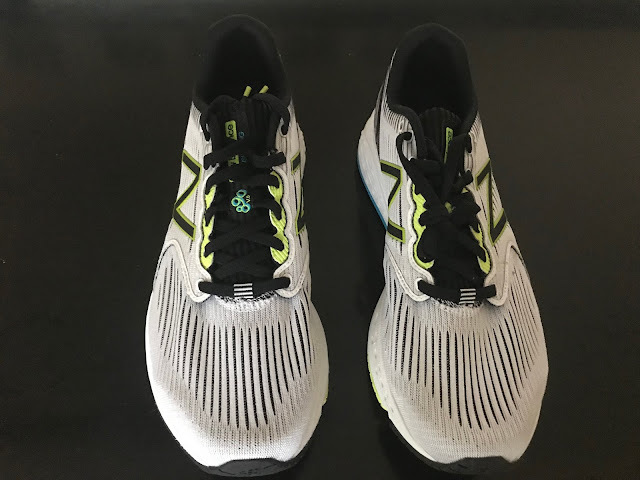 Also, NB has the most intricate line of shoes: Vazee, FreshFoam, Hanzo, numeric series. Thank you, great review. Sam, the comparisons with the Tempo 9 are very helpful. Thanks for the review! Do you know if this will come in a Wide? Great review Sam! x2 from above question about coming in widths. Also would u say this is a more cushioned or beefed 1400 ? I’ve loved the 1400 ever since version 1 But was always hoping for something similar with more cushioning for training and longer runs. New Balance 890v6 is my first pair of New Balance running shoes. I'm fairly new to being a regular runner and before these always ran in Adidas's, specifically Alphabounce. For the price, the 890v6 is definitely worth the money. The 890v6 will be available in 2E wide when it releases around 3/1/18. As for a comparison to 1400 the 890 adds 4mm more forefoot stack and keeps the same 25mm heel stack so a more cushioned forefoot using the same RevLite as the 1400, so same midsole materials. 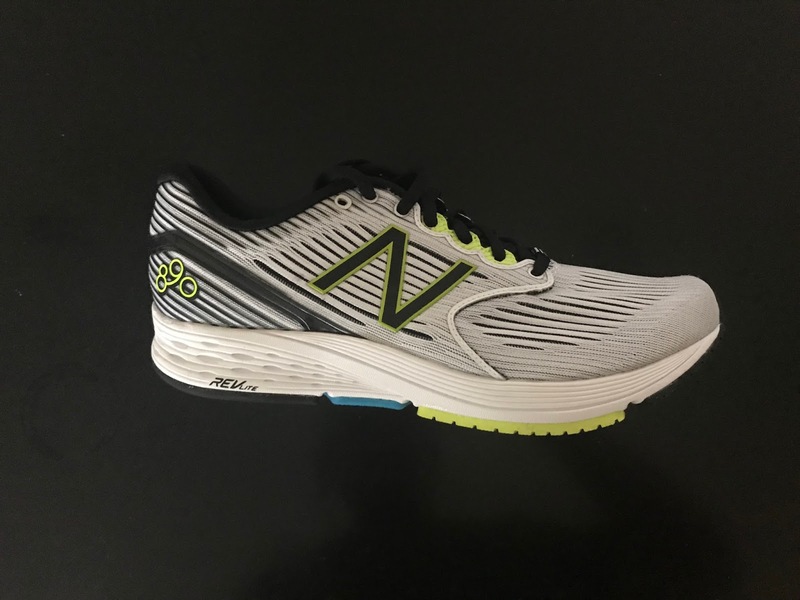 The 890 is a stiffer and more stable shoe for sure, almost or actually a light stability/support trainer due to it is mid foot outsole coverage whereas the 1400 is more flexible up front and a lighter shoe. 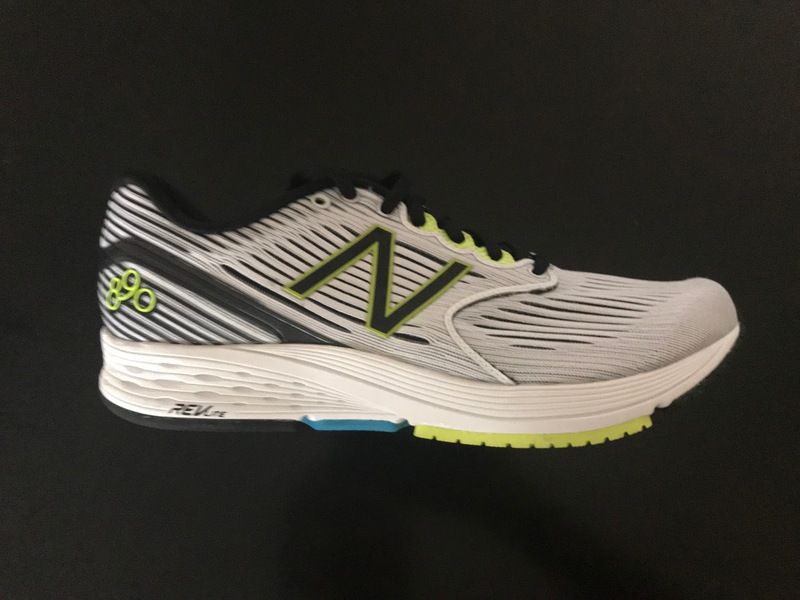 I run neutral but do appreciate some extra stability/support but find the 890 at my limit in terms of its mid foot support unless I am at tempo paces. Hope this helps. 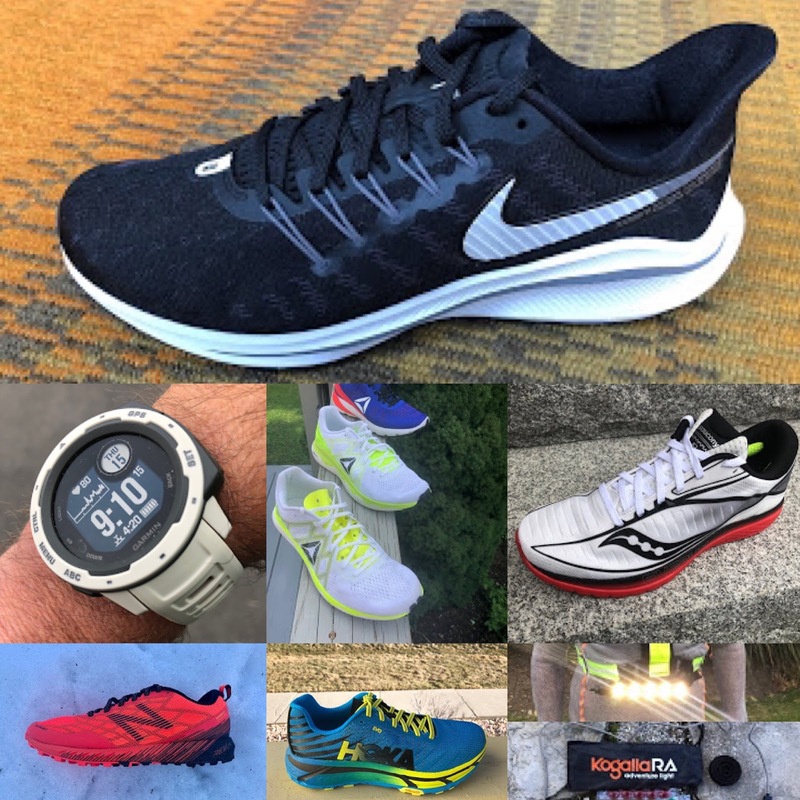 I've worn the Pegasus 34 which seems to be a good mix of everything. I found the Skechers gorun ride 7 too narrow along with a low vamp upper created a feeling of tipping over definitely aggravated ankle. Would you think I would be a wide in 890v6? Hi NB, I think would find the normal width 890 fairly close in fit to the Peg 34 although I found the fit of the 890 more consistent overall with less pressure at the front lace up metatarsal area and easier softer vertical toe room. 890 has a fantastic upper. As far as the Ride 7 you might be feeling the soft not always stable midsole. 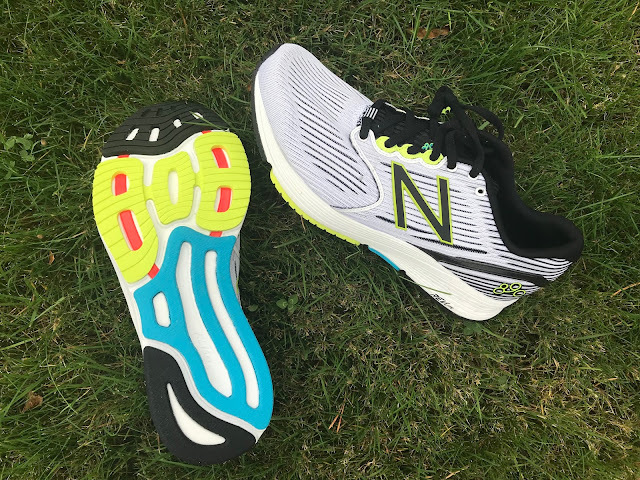 The 890 is considerably firmer and the mid foot outsole coverage puts in between neutral and stability so in many ways light stability shoe for me. So is the verdict that these shoes lose their bounce in only 50 miles? I really want to get these but can't have that lack of quality. I was thinking about using these for the NYC Marathon but maybe I should look at the Reebok SR2? They don't have much bounce to begin with but they do have pop and response. They are firm RevLite and as such are.. on the firm side and stay that way likely get firmer.They are a very different shoe than SR2 as they clearly have a stability element from the mid foot outsole. I struggled to run them slower paces more than SR 2 so they may be a tough shoe later in a marathon unless you really need the stable mid foot. They have a lot of stiff spring from the plastic elements and are far less flexible than the SR 2 so much more responsive.The upper is sensational, a reasonable performance fit but not the easier very comfortable fit of the SR 2 which in later miles likely will be somewhat less supportive. Hope this helps.